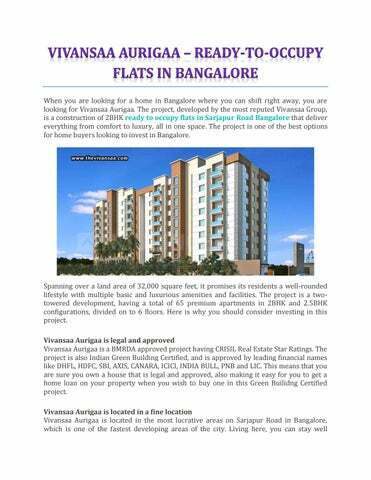 When you are looking for a home in Bangalore where you can shift right away, you are looking for Vivansaa Aurigaa. The project, developed by the most reputed Vivansaa Group, is a construction of 2BHK ready to occupy flats in Sarjapur Road Bangalore that deliver everything from comfort to luxury, all in one space. The project is one of the best options for home buyers looking to invest in Bangalore. connected to some of the key IT clusters like Electronic City, Whitefield, Outer Ring Road, Koramangala, and Marathahalli. 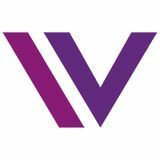 Vivansaa Aurigaa defines luxury Vivansaa Aurigaa is a magnificent piece of the Vivansaa Group with spacious and detailed ready-to-occupy flats in Sarjapur. It represents the new definition of luxury clubbed with safety and serenity, delivering a holistic embalmment of modern living, matching the needs of the radical crowd with the best of amenities. The projects provides residents with 24×7 CCTV surveillance and 24×7 power backup, thus making life safe and easy. It also offers amenities like an air-conditioned gym and a swimming pool, which helps you stay fit and healthy, while having some fun. Vivansaa Aurigaa is strongly built Vivansaa Aurigaa has a foundation that is made of an earthquake-resistant RCC structure, which in itself speaks volumes of the strength of the building! With the homes being strong from the inside, they are also secured completely on the outside with security systems installed. These include CCTV camera surveillance at the main entrance, video phone with intercom facility at every home’s main door, and a security cabin linked with video intercom that is linked to each apartment. Vivansaa Aurigaa offers all the basic amenities There is power backup available in every corner of the Vivansaa Aurigaa project so that nobody on the plot lives without electricity for even a minute! Every apartment, the common area, and the lift – everything is covered with power backup. There is a wide staircase with emergency exits at strategic points, and also four high-speed elevators. The electric wiring is completely safe with copper wiring and branded modular switches. There is 24 x 7 water supply with adequate water storage in the underground water tanks. Furthermore, to make the project environment-friendly, there is also a sewage treatment plant that purifies water of its wastes and makes it available for gardening or flushing out the toilet washes. Vivansaa Aurigaa is beautifully built Along with the above mentioned strong characteristics and the basic amenitiesavailable, Vivansaa Aurigaa also has a beautiful side. It is built with every detail taken care of by the designers and engineers. The flooring is done with 800 x 800 double charged vitrified tiles that are wood finished and slip resistant. The external walls are gypsum finished and internal walls are finished with supreme quality OBD. The doors are solid and thick with lamination on both sides, and a granite frame. The windows are sliding ones made of aluminum and granite frames, installed with a mosquito mesh and grills. The homes have glass railings. The kitchen is very spacious with attached water purifier, and exhaust fan installed. With all of the above, you can rise up to a life of timeless elegance with Vivansaa Aurigaa’s ready to occupy flats in Sarjapur Road Bangalore!